Do We Care Enough about Justice for an Afghan Woman? Farkhunda was sacrificed because of people’s ignorance. A crowd of Afghans, a mob that included our own Kabul police, the ones who are supposed to protect us, burned her. So of course we want justice. Not only for her, but for ourselves. We all want justice, but who is able to give us justice? Who has the power to stand up against such oppressive violence in our society? I cannot say on my own that our justice system and the courts that tried 49 people for Farkhunda’s death were corrupt, but we all saw the videotapes showing the killers carrying out the attack in March. We can’t clarify what happened behind the closed doors of the court, but we know there are some people who do not let justice proceed honestly. Sometimes I think no one cares enough. Maybe because we lack consideration for others. The road where Farkhunda was mobbed and run over by the wheels of a car and burned now carries her name, but this is not justice. Having a road named for you is not justice. Otherwise, she is forgotten, just four months after the killing resulting from her visit to the mullah at Shah-Do Shamshira mosque. I don’t believe now that Farkhunda’s real killers will pay for their actions. They should be hanged. It would not help Farkhunda, but it would be a warning to others that we will not tolerate this level of oppressive violence against women. Unfortunately, it is now clear that this will never happen because some of the killers have powerful people behind them. The people who judged the case on the high court are in some ways like those who killed Farkhunda. If they were to punish all of the criminals, then their own faces and secrets would come out and they would lose their high posts, their money and freedom. So they punish some, and let others go. Maybe Afghan people should go on strike and fight for justice for Farkhunda? But we have already had many demonstrations about this and our highest authorities in government could take action if they wanted to. If they followed the laws, they could punish the killers fairly. It is up to our government and courts to keep their promises and punish the killers to set an example for next time. Ordinary Afghan people can’t solve this dilemma. Our voices are not heard. How do we shout for justice? We don’t have only one Farkhunda. We have many women like her who are forgotten. Their fates become a mockery of justice. This is a horrible problem. It is right for you to point this out. For you are right when you say that a street name change is not justice. That said, I pray that it helps people never forget. Thank you for writing this essay! Masooda, thank you for this very powerful and eloquent response on this very brutal injustice. Your words are eye-opening for those who don’t understand all of the issues at hand. Thank you very much for writing this essay! 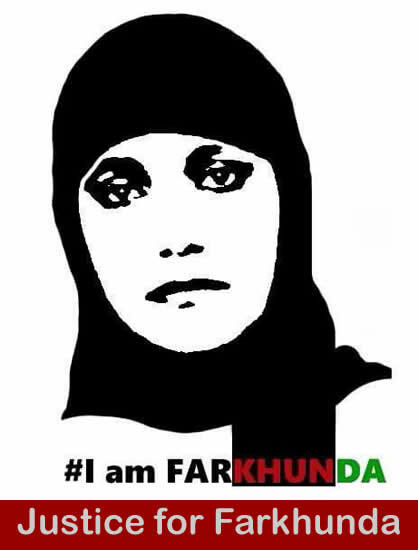 Masooda, your essay will help us remember Farkhunda. Change may be very slow, but I believe it is happening. I believe this because we know her name. As you said there are many women like her who have been forgotten. Your writing will help turn the wheel of justice. Keep writing.